Celebrate the last days of summer! There is much gorgeous produce at the markets, but leaves are starting to turn up North and THE APPLES are coming! Get cozy with the bounty of fall! Here is a recipe that combines what’s fresh & bright right from the cusp of the seasons. Heat grape seed oil in a large cast iron skillet over medium heat for a minute. Place apples in the pan, cut side down. Cook, turning as needed to brown evenly, about 15 minutes. Remove from pan and set aside. Add olive oil to the hot pan and then the shallot and chili, stirring until just aromatic. Add corn, thyme sprigs, a pinch of salt and a fresh grind of pepper to the pan. Cook for a few minutes until the corn is tender and bright. Add blanched fava beans and combine to heat through. Drizzle in apple cider vinegar, toss to combine and remove from heat. Season to taste. Season fish with salt and fresh ground pepper. Starting at one end of a fillet, gently wrap each with two pieces of pancetta, overlapping slightly as you go. Set aside. Add a swirl of grape seed oil to the hot pan, if needed, and then gently place the wrapped fillets in the pan. Cook on all four wrapped sides, just until the pancetta is crispy and the fish is almost cooked. Remove and set aside, covered – the residual heat will finish the fish. Spoon succotash onto warmed plates or shallow bowls. 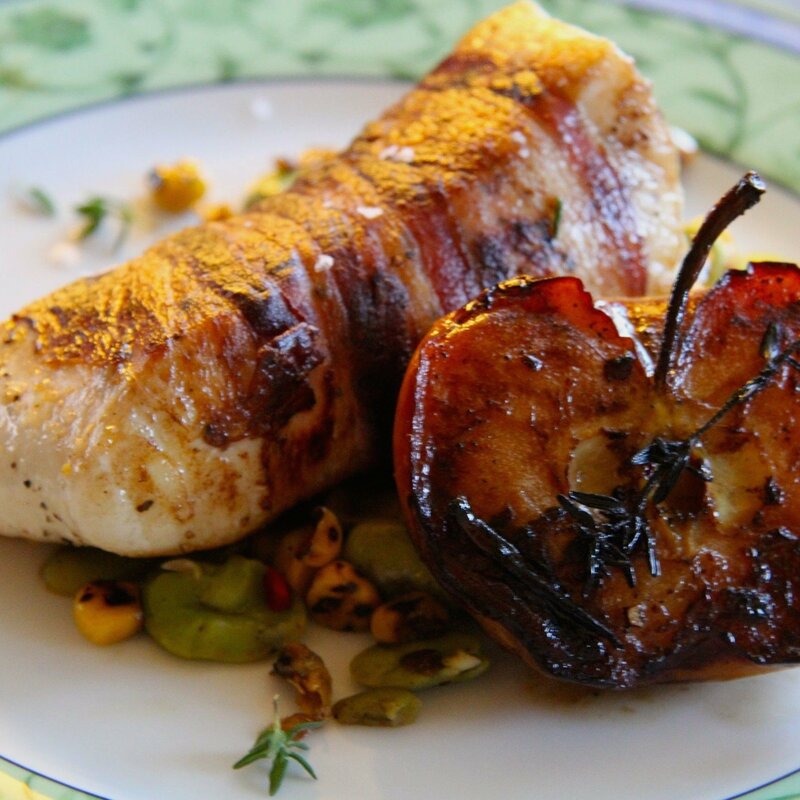 Place a piece of fish and half a roasted apple on top, add a sprinkle of Maldon and serve immediately! This dish is wonderful with a crisp glass of apple cider, hard or sweet. Thank You, Hipcooks SD Assistants!